Jammu, Sep 11 (PTI) Pakistani troops today violated the ceasefire by firing and shelling along the Line of Control (LoC) in Jammu and Kashmir's Poonch district. "Pakistan Army troops initiated unprovoked and indiscriminate firing of small arms, automatics and mortars from 1345 hours in Poonch sector along the LoC," a defence spokesman said. The Indian troops were retaliating strongly and the firing is on, he said. On September 9 also, the Pakistani Army had violated the ceasefire along the LoC in Debraj, Krishna Ghati and Ishapur in the Mendhar sector prompting retaliation by the Indian troops guarding the border, a police official said. On September 4, Pakistani troops violated the ceasefire twice by firing at forward posts along the LoC in Degwar and Maldalyan areas in Poonch and along the International Border (IB) in Arnia sector of Jammu after which the Indian security forces retaliated. On September 3, the Pakistan Army initiated unprovoked and indiscriminate firing of small arms, automatics and mortars in the Krishna Ghati sector in Poonch along the LoC. On September 1, Assistant Sub Inspector (ASI) Kamaljit Singh of the Border Security Force sustained bullet injuries due to firing from across the LoC while he was deployed at a forward post in the Krishna Ghati sector. Singh later succumbed to injuries. 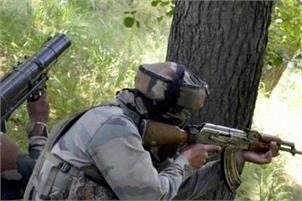 Incidents of ceasefire violation by Pakistan have increased sharply this year. Till August 1, there were 285 such violations by the Pakistan Army, while in 2016, the number was significantly less at 228 for the entire year, according to the Army figures.